It took years of planning and millions of Rupees to design one of India's first planned cities, but Chandigarh's biggest tourist attraction was not on the master plan of Swiss-French architect Le Corbusier. It was the product of creative imagination and fifty years of labor by a humble government official Nek Chand. 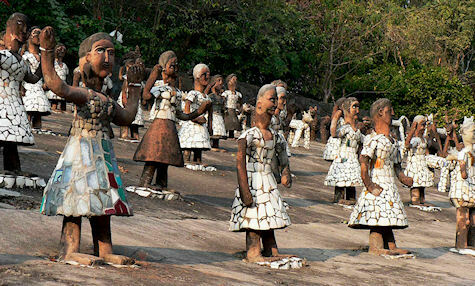 In 1957 Nek Chand started working on his secret sculptural project. He would cycle to a gorge near Sukhna Lake that was used as dumping ground, and spend hours collecting discarded pieces of broken pottery, bottles, auto parts, plumbing materials, street lights, electrical fittings, broken sanitary ware and so on. He would carry the pieces to a nearby warehouse and fashion them into artistic forms resembling humans and animals.